CHIQUITA. Arqana organises the Deauville Intl. Yearlings sales. Arqana’s powerful shareholders. 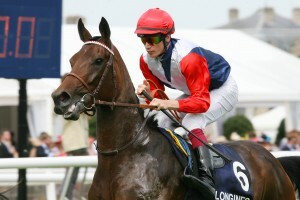 Chiquita 2nd in the Prix de Diane Longines. 16/06/13. image copyright APRH Chantilly. Hamelin Antoine. Chiquita bought by Badgers Bloodstock, on behalf of Paul Makin, August 2011 at the Deauville Yearling sales,organised by ARQANA, & presented by the wealthy Ecuries Monceaux. Arqana is the leading race horse auction house in France, & the second player in Europe. Arqana formed in 2006, when Agence Francaise de Vente de Pur Sang fusioned with Goffs. Arqana was formed. Son Altesse the Aga Khan, a noted race horse breeder, is a majority shareholder in Arqana,. As is Artcurial, the auction house, amongst whose share holders are the powerful industrial group, Groupe Dassault.